Clyde manager Barry Ferguson admitted to leaving Berwick feeling frustrated after watching his side take a point from a 1-1 draw on Saturday. Pace setters Forfar Athletic lost for the first time this season, but failure to win at Berwick meant Clyde only cut the gap to the leaders by one point instead of three. “We dominated for most of the game and it was frustrating to only take one point,” he said. “I feel this is a massive two points we have dropped. “I have no criticisms of the players with regards to their level of commitment. They were full of running and energy, but I had to question their decision making, especially for the Berwick goal. “We are only taking split decisions, but that one instance showed how important they can be. “I thought we controlled most of the first half, but to give a goal away like that just a couple of minutes before half time was disappointing. Berwick manager John Coughlin admitted his side had dodged a bullet when they managed to hold out for a point. “I honestly thought that with the quality Clyde possess, plus all the problems we are having with injuries, we might have been on for a bit of a beating today,” he admitted afterwards. 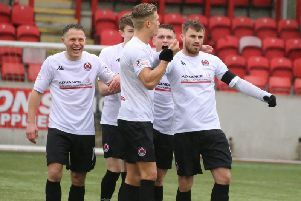 With no game this weekend Clyde have a couple of weeks to kick their heels before they get back into action on October 15, away to league new boys Edinburgh City.